Terminator: Genisys is 2015 science fiction-action film from director Alan Taylor. It is the fifth film in the Terminator franchise. 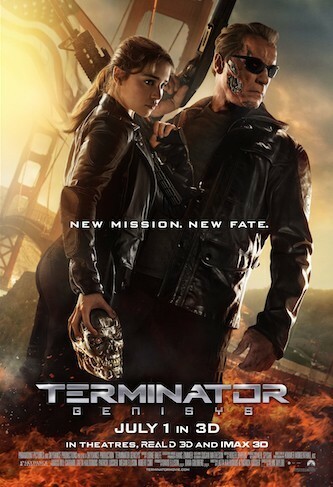 The film is essentially a remake, reboot, and re-imagining of the first film, The Terminator (1984). In Genisys, a soldier travels back in time to 1984 to protect the mother of his commander, but finds that things are not the way he believed they were supposed to be. Terminator: Genisys opens in 2019, where John Connor (Jason Clarke) leads the Human Resistance. Conner is launching what he has told his soldiers is the final offensive against Skynet, an artificial intelligence system seeking to eliminate the human race. After infiltrating a Skynet outpost, Connor discovers that Skynet has just activated a time machine that has sent a “Terminator” (a cyborg that hunts and kills humans), back in time to kill his mother before she gives birth to him. Connor's right-hand man, Sgt. Kyle Reese (Jai Courtney), volunteers to travel back in time to protect Connor's mother. On his way through time, Reese witnesses events that shock him. When he arrives in 1984, Reese finds that John Connor's mother, Sarah Connor (Emilia Clarke), is not the woman he expected to find. And the Terminator that should be trying to kill Sarah is called the “Guardian” (Arnold Schwarzenegger), and he/it is also acting strangely. Skynet still wants to kill Sarah Connor, but nothing is as Reese expected to find it. The Terminator, the 1984 film co-written and directed by James Cameron, has aged well. The film's pre-CGI effects still look good and are quite effective. Other than Cameron's sequel, Terminator 2: Judgment Day, the other Terminator films are CGI-heavy, and CGI does not serve Terminator: Genisys very well. It is as if the filmmakers have vomited their imaginations onto the screen, and there is a line of code to bring every chunk and fluid ounce of it to life. I find that some film critics easily ignore and/or dismiss that at the heart of James Cameron's best and most famous films is a love story, and that was the heart of the first Terminator film. Kyle Reese falls in love with Sarah Connor via the stories her son, John Connor, told him. In the end, Reese risks everything to traverse the “oceans of time” to be with Sarah. Whether you buy that love story or not, The Terminator 1984 was more than just a story about a two soldiers from the future shooting up Los Angeles circa 1984. Terminator: Genisys, which is (let's be honest) a remake of the original film, tries and fails to recapture all the dynamism of the original Kyle Reese-Sarah Connor dynamic. First Jai Courtney as Kyle Reese does not work for me because I keep thinking about the actor who first played Reese, Michael Beihn. Emilia Clarke looks like a high school girl; she lacks the maturity and world-weary aura that Linda Hamilton had as the original Sarah Connor. Schwarzenegger is tolerable, but Terminator: Genisys features his least charismatic version of the classic T-800 Terminator that first exploded on screen in 1984. Terminator: Genisys is wall-to-wall action, and except for a few moments (mostly in the first half of the film), I found myself not very interested. 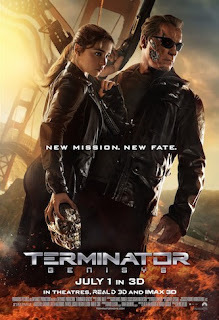 If you, dear readers, have seen the other Terminator films, see Terminator: Genisys for the sake of completion.